Arianespace’s second Ariane 5 flight of 2014 has been approved for its March 21 liftoff following today’s successful launch readiness review, which was performed at the Spaceport in French Guiana. The review is held prior to each Ariane 5 mission, ensuring that the heavy-lift vehicle and its payload are flight-ready, along with the Spaceport’s infrastructure and the network of downrange tracking stations. With today’s “green light,” Ariane 5 is now cleared for its March 20 rollout from the Final Assembly Building to the ELA-3 launch zone – where it will be readied for liftoff on Friday during a launch window opening at 7:05 p.m. local time in French Guiana. The payload lift performance for Arianespace’s latest Ariane 5 mission is more than 9,575 kg., which includes some 8,755 kg. for its two satellite passengers – ASTRA 5B and Amazonas 4A – along with the launcher’s dual-payload dispenser system and satellite integration hardware. 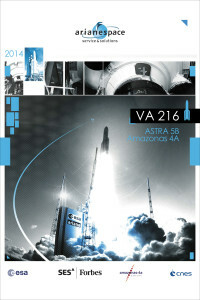 Riding in the Ariane 5 payload “stack’s” upper position is ASTRA 5B, which was built by Airbus Defence and Space for SES, and will operate from a 31.5 deg. East orbital slot. Based on the Eurostar E3000 platform, this spacecraft will be deployed first during the 34-minute flight sequence and is outfitted with 40 Ku-band and 6 Ka-band transponders. Amazonas 4A is installed in the payload stack’s lower position, and its deployment by Ariane 5 will mark the mission’s completion. The Orbital Sciences Corporation-produced satellite, which is equipped with 24 Ku-band transponders, will be operated by HISPASAT from an orbital position of 61 deg. West.